State Sen. Dean Kirby leases a vehicle, pays for auto insurance and gasoline, and buys Braves season tickets with money from his campaign account. He spends thousands a year on a campaign credit card, despite having no opponents for re-election for most of his 25 years in office. He says much of this spending is to cover expenses from serving as a lawmaker. But he also receives thousands of dollars a year from taxpayers for expenses. He received $19,440 last year to cover travel, food and other costs beyond the $23,575 considered salary for the part-time legislative job. Kirby lives in Pearl, just a short distance from the Capitol in Jackson. 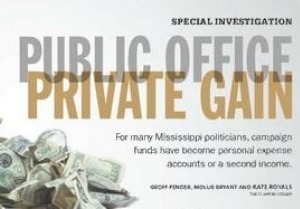 A Clarion-Ledger investigation shows that for many Mississippi politicians, campaign funds have become personal expense accounts or a second income — potentially tax free. The spending is largely paid for by lobbyists and special interests doing business with state government. They otherwise would not be allowed to lavish cash, gifts or a second income on politicians. Campaign funds are shielded from taxes, ethics and other laws because they are ostensibly to be used only for campaigning and records of them are — ostensibly — open to the public. Most states and the federal government, in efforts to reduce the corrosive influence of money in politics, have stringent reporting requirements. Mississippi doesn’t.